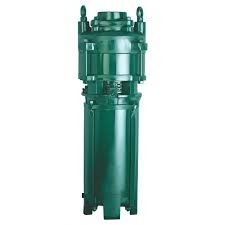 A domestic Borewell submersible pump (or sub pump, electric submersible pump (ESP)) is a device which has a hermetically sealed motor close-coupled to the pump body. The whole assembly is submerged in the water in deep well ranging from 200 feet depth to 1200 feet to pump the water to surface. when higher yield is required for large apartment of building and also for agriculture purpose. GoswamiEngineering Works, a soleproprietorship took its roots in 1991, Jaipur, Rajasthan, since then it has evolved as a market leader of world class quality products. From the very initial years it has very productively catered to the needs of its domestic clients and since then there has been no looking back. Impeccable quality, simplicity, robustness, reliable productivity with low cost of operation and maintenance are the technical solutions used in machine design, guaranteeing the highest performance levels. Since its inception the company has grown with the changing times adopting the most-up to date technology to distinguish itself in industrial market. Throughout the years the incessant efforts & ardour for excellence has led Goswami Engineering Works to widen its reach at domestic market giving tough competition to its other counterparts. In addition to this our dedicated and focused R&D team has always shown keen desire for technical up gradation, to ensure high performance standards of our machines. State-of-art facilities matching international quality standards.